Auto dealer Ernie Boch Jr. participates in a seminar on etiquette for professionals. Boch and five of his managers attended to polish their dining skills and "room working" talents. Without consulting Miss Manners, can you tell what’s wrong with this scene? A young woman – we shall call her Mary – walks into a cocktail party and dinner function for the firm where she has just been hired as an account executive. Mary wears a sleeveless black dress, with pearls, dangling diamond earrings, and black flats. She picks her name tag up off the table and pins it on the left of her dress front. Next, Mary spots the man who sits next to her in the office – we’ll call him John – and waves, gesturing to indicate that she will be over soon as she grabs a drink. With her gin and tonic in her right hand, Mary heads toward John, who is conversing with an executive. John introduces the executive to Mary. They shake hands. Mary looks the executive up and down, smiles and says “hello.” John makes a toast to Mary’s new job. Mary, John and the executive raise their glasses, and all take sips. When dinner is announced, Mary is the first to sit down. She immediately puts the napkin in her lap. Mary dressed all wrong. Women should avoid sleeveless dresses in corporate settings (studies show they instantly lower credibility), dangly earrings, and flat shoes, unless the women are very tall. Mary’s hairstyle was inappropriate for an executive. Corporate women should never wear their hair longer than shoulder length. Mary was too effusive. Never wave or gesture openly at a cocktail party, nor head directly for the bar or food table. Mary used the wrong hand to hold her drink. One should never carry a drink in one’s right hand at a cocktail party, because it would be cold and wet when shaking hands. Mary was rude. One should never look a business colleague up and down—only look her or him in the eye. Mary displayed poor manners during the toast. Never drink a toast that has been made to you. Only drink a toast made to other people. Mary took too many liberties at the dinner table. The host should be the first to be seated, and the first to place a napkin in his or her lap. He flubbed the introduction. It is important to introduce the person of lesser status to the higher-ranking person, not the other way around. The one-day course is offered by Tunnicliffe’s Hingham company, a finishing school called The Proper Manner. The course costs $395 a person and covers everything from “Perfectly Proper Introductions” to “Top 10 Signs of a Savvy Diner.” A recent workshop held at the Ritz-Carlton hotel in Boston drew executives from the automotive, beer, telecommunications, travel, and hotel industries. Tunnicliffe, age “30-something,” was raised by “very proper parents” in southern Illinois and majored in Journalism at the University of Missouri. In 1991, she left a lucrative marketing and advertising career in the Boston area to teach etiquette to children. But when parents began discreetly asking for tips, Tunnicliffe knew there was also a need for a manners class for adults. While emphasizing etiquette and protocol may seem frivolous in today’s dress-down world, research indicates that humans remain a shallow bunch impressed by poise and good manners. Like it or not, said Tunnicliffe, careers are made—and ruined—every day, based not on work but on appearances. This is old news to Ernie Boch Jr., vice president of his family’s successful auto dealership. A good salesperson is a master of appearances, he said during the workshop, where he was a participant. Boch brought five managers to Tunnicliffe’s recent workshop at the Ritz-Carlton, in order to burnish their dining skills and his “room working” talents. For those who sneer at etiquette, consider that Tunnicliffe acknowledged during the workshop that she would not have hired a particular intern had she known about his lack of refinement in the dining room. 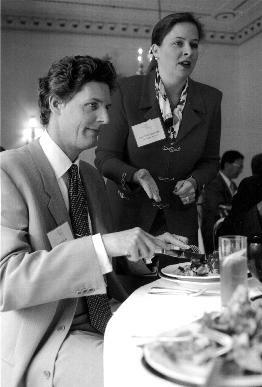 To practice protocol, workshop participants were seated at tables and taught to decipher complex place settings during a multi-course meal—how to tell a fish fork from a salad fork, for example. 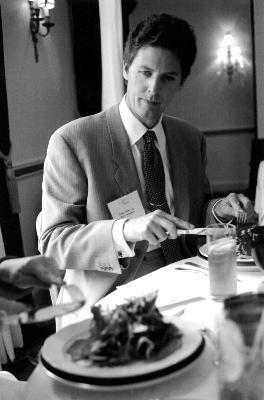 They also learned how to use finger bowls properly and were treated to the story of former President George Bush and the finger bowl: Upon seeing that an ignorant dinner guest was drinking the water from his finger bowl, Bush lifted his bowl and drank too, presumably to make the guest feel at ease. McMurry runs a company similar to Tunnicliffe’s, in North Carolina. A former debutante, McMurry gave many suggestions that are sensible enough: groom well, make eye contact, smile, keep hands out of pockets, nod, and don’t crack your knuckles or twirl your hair. Other suggestions, however, are more surprising: get rid of scars and birthmarks with laser surgery, have plastic surgery to "correct" aging and, for women, dye gray hair and wear hair no longer than shoulder length. "It's not fair, we know that," said McMurry. "Life is not fair. And I am not advocating plastic surgery or dyeing your hair. My mother-in-law has beautiful white hair, like Barbara Bush, who is a great example of a successful wife. We are just saying that the research very clearly shows that once a woman starts to look old, she is perceived as tired and less effective, no matter how good the work is that she is doing...And it is proven that women who make it to the top have hair at or above shoulder length." "We are invited to corporate dining situations all the time," said Boch (above), with trainer Amy Mills Tunnicliffe.